The eldest of six children born to Catholic parents, Franz was raised in a village in the part of Austria known as Carinthia. His father was a farmer and quarryman. Disillusioned with Catholicism, his parents became Jehovah's Witnesses during Franz's childhood and raised their children in their new faith. As a teenager, Franz was interested in painting and skiing. 1933-39: Franz was apprenticed to be a house painter and decorator. After Nazi Germany annexed Austria in 1938, like other Jehovah's Witnesses he refused to swear an oath to Hitler or to give the Hitler salute. Neighbors reported him to the police, but his boss protected him from arrest by saying that his work was needed. 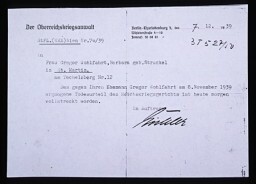 When the war began in September 1939 Franz's father was arrested for opposing military service. He was executed in December. 1940-44: Following his twentieth birthday, Franz refused to be inducted into the German army. In front of hundreds of recruits and officers he refused to salute the Nazi flag. He was arrested on March 14, 1940, and imprisoned. Later that year, Franz was sent to a penal camp in Germany. A new commander felt sorry for him; three times he saved Franz from execution between 1943 and 1945. He was impressed that Franz was willing to die rather than to break God's command to love his neighbor and not kill.